Our country Nepal, officially the Federal Democratic Republic of Nepal, is governed according to the constitution of Nepal drafted in 2015 AD, September. Nepal has adopted multiparty system as the executive organ of governance and as of now, we are very familiar with the political parties. Political parties are a group of people with a common ideology who work together in the elections for the power in government. The members of the party agree in common policies and programs to run their party so that they can do well for their supporters and the country as a whole. Since the constitution of Nepal provides for the multi party system of the government, there are numerous political parties in Nepal. Coming to now, there are more than 100 political parties. However, all of them are not in the mainstream. Some are major political parties, that have been known to the public since the history� of political parties were founded whereas some are fringe political parties which are just fledgling on their political career. Nepali Congress Party (NCP): It is the premier political party of Nepal that led the democratic movement in 1950 to end the Rana regime in Nepal and allowed the common people to take part in the politics. It was founded in 1950. Its headquarter lies in B.P. Nagar, Lalitpur. It is a reform-oriented centrist party and its ideology includes social democracy and democratic socialism. �Tree� is its election symbol. Presently, the influential leaders within the party are Sher Bahadur Deuba (President), Arjun Narasingha K.C. (influential leader), Bimalendra Nidhi (influential Madhesi leader), Ram Chandra Poudel (Senior Leader), Gagan Thapa (prominent youth politician), etc. Nepal Communist Party (CPN UML: Unified Marxist-Leninist): It is the largest communist party of Nepal and was founded in January 6, 1991. Its headquarter lies in Balkhu, Kathmandu. This party resulted as the product of Jana Andolan (People’s Movement of 1990). Its election symbol is �Sun�. The chairman of the party is Khadga Prasad (KP) Oli and vice chair persons are Bam Dev Gautam, Astha Laxmi Shakya, Yubaraj Gyawali and Bhim Rawal. Communist Party of Nepal (Maoist-Centre): Following the ideology of Marxism, Lenninism and Maoism, this party was founded in 1994 and its headquarter lies in Kathmandu. The party launched �Nepalese People’s War� in 1996 and were in arms for the establishment of democracy in the country. This party is led by chairman Pushpa Kamal Dahal (commonly known as Prachanda). Rastriya Prajatantra Party Nepal: It is the only royalist political party of Nepal that is the splinter group of Rastriya Prajatantra Party. The ideologic pillars of the party include Hindu nationalism, monarchism, conservatism and economic liberalism. It was founded in 1990, May 29. The chairman of this party is Kamal Thapa and its headquarter lies in Kathmandu. The election symbol for this party is �cow�. Bibeksheel Nepali dal: The political party of Nepal, Bibeksheel Nepali Dal whose English translation is Party of Rational Nepalese was founded in 2012 and legalised in 2014. Its headquarters is in Maharajgunj, Kathmandu. With the election symbol, smiling face, this party was principally founded to empower the youth in politics of Nepal. Its ideology includes pragmatism, reformism and progressivism. The chairman of the party is Ujjwal Thapa. 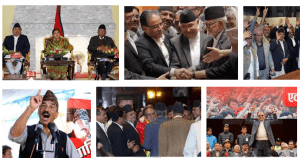 Naya Shakti Nepal: This is the political party that was founded under the leadership of former Prime Minister of Nepal, Dr. Baburam Bhattrai in June 12, 2016. He is the chairman of the party. With the ideology of democratic socialism, it firmly believes in directly elected presidential system instead of PM elected by majority in the parliament which exists in our country presently. Its election symbol is eye and it is headquartered in Babarmahal, Kathmandu. Madhesi Jana Adhikar Forum, Nepal: This political party was founded in 2006 and is headquartered in Kathmandu. Its ideology includes social democracy, Terai basi people’s rights, Madhesh autonomy, self determination and federalism. The founder of this political party is Upendra Yadav. Rastriya Janamorcha: It is the political party that emerged as a splinter group of Janamorcha Nepal. It was founded in 2006 and is headquartered in Kapan, Kathmandu. Its ideology is communism and it opposes federalism in Nepal. Its election symbol is �glass�. Its president is Chitra Bahadur K.C. Sadbhawana Party: Emerging from the split in Nepal Sadhbhavana Party, this political party was founded in 2007. Its headquarter lies in New Baneshwor, Kathmandu. It believes in the ideology of equitism, federalism, participatory democracy and patriotism. Its president is Rajendra Mahato.